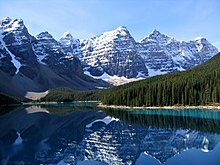 ^ "Alberta, Canada". Encyclopedia Britannica. Retrieved 2017-09-20. ^ "Atlas of Alberta Railways Maps – Alberta Land Grants". ualberta.ca. Retrieved 2016-05-15. ^ "Alberta Weather and Climate Data". Government of Alberta, Department of Agriculture and Rural Development. 2012. Retrieved 2016-05-15. ^ "Alberta Clipper". The Weather Notebook. Archived from the original on 2015-02-19. Retrieved October 1, 2012. ^ "Plant Hardiness Zone by Municipality". 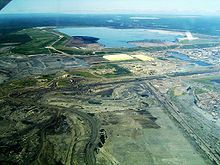 Natural Resources Canada. Government of Canada. Retrieved 27 July 2016. ^ Jewish Virtual Library. 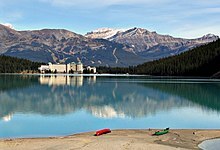 "Encyclopedia Judaica: Alberta, Canada". Retrieved 15 December 2016. ^ "Canadian Federal and Provincial Fiscal Tables" (PDF). Economic Reports. Royal Bank of Canada. Retrieved 17 August 2017. 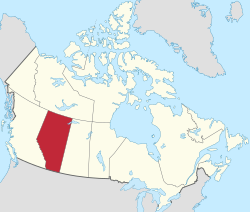 ^ "HER MAJESTY THE QUEEN IN RIGHT OF THE PROVINCE OF ALBERTA AS". NASDAQ.com. Retrieved 2016-05-15. ^ "Regional differences to narrow in 2016" (PDF). Retrieved 2017-04-30. ^ Gerson, Jen (7 April 2013). "Preserving prairie cathedrals: Progress is leaving Alberta's historic grain elevators in its wake". National Post. Postmedia Network Inc. Retrieved 18 January 2017. ^ "Beekeeping in Alberta". Government of Alberta Agriculture and Rural Development. Government of Alberta. Retrieved 18 January 2017. ^ "Legislative Assembly of Alberta". assembly.ab.ca. Retrieved 2016-05-15. ^ "Building On Our Strength". Finance Alberta. Government of Alberta. Retrieved 19 May 2016. ^ "2011 Regulated Property Minister's Guidelines". Alberta Municipal Affairs. Retrieved 2012-04-28. ^ "Government of Alberta". 2011-11-07. Retrieved 2016-09-24. ^ "Service Centres" (PDF). Government of Alberta. Retrieved 2016-05-19. ^ "Advocacy". University of Alberta. Retrieved 2016-05-19. ^ Bellamy, Marshall (February 16, 2005). "Klein promises tuition freeze". The Gazette. Archived from the original on 2013-08-10. Retrieved December 13, 2011. ^ "Twinning Relationships". Government of Alberta. Archived from the original on 2016-04-09. Retrieved April 12, 2014. ^ "California's Sister State Relationships". ca.gov. Retrieved 2016-05-15. Berry, Susan; Jack Brink (2004). Aboriginal Cultures in Alberta: Five Hundred Generations. Provincial Museum of Alberta. ISBN 0-7785-2852-9. Retrieved 2012-10-21. Cavanaugh, Catherine Anne; Michael Payne; Donald Wetherell; Catherine Cavanaugh (2006). Alberta formed, Alberta transformed, Volume 1. University of Alberta Press. ISBN 1-55238-194-3. Retrieved 2012-10-21. Connors, Richard; Law, John M. (2005). Forging Alberta's constitutional framework. University of Alberta – Centre for Constitutional Studies. ISBN 0-88864-457-4. Retrieved 2012-10-21. Holt, Faye Reineberg (2009). Alberta: A History in Photographs. Heritage House ; Lancaster : Gazelle. ISBN 978-1-894974-87-5. Retrieved 2012-10-21. Melnyk, George (1999). The literary history of Alberta. University of Alberta Press. ISBN 0-88864-296-2. Retrieved 2012-10-21. Taylor, Alison (2001). The politics of educational reform in Alberta. University of Toronto Press. ISBN 0-8020-4813-7. Retrieved 2012-10-21. This page is based on the Wikipedia article Alberta; it is used under the Creative Commons Attribution-ShareAlike 3.0 Unported License (CC-BY-SA). You may redistribute it, verbatim or modified, providing that you comply with the terms of the CC-BY-SA.